If you’re looking to do a Jays game tightwad style, it’s easy enough…there are already lots of cheap Blue Jays tickets to begin with. You need only be willing to sit in the 500 level somewhere. But if you’re looking to find deals for wherever you’re sitting, here’s three suggestions for you. Hmmm…I’m thinking this is the spot. 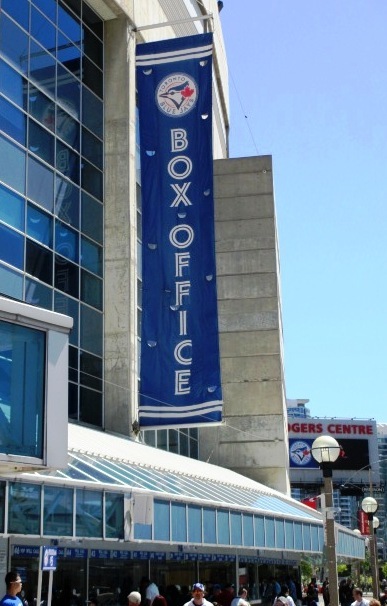 Cheap Blue Jays Tickets, Tip #1) Use The Box Office. Blue Jays games rarely sell out, especially when the team isn’t in contention. It’s easy enough to order tickets at the box office on game day, saving yourself the considerable online fees. Here’s a bonus tip for you…the box office close to the Union Station Skywalk is by far the most popular, so try another one to avoid waiting in line. I tried this for a weekend game on a beautiful June day…against the Yankees…and didn’t wait at all. No thanks man…I found mine on SeatGeek! Cheap Blue Jays Tickets, Tip #2) Use A Third Party. For low demand games especially, you can often find a better deal for tickets on StubHub or with my affiliate friends at SeatGeek. 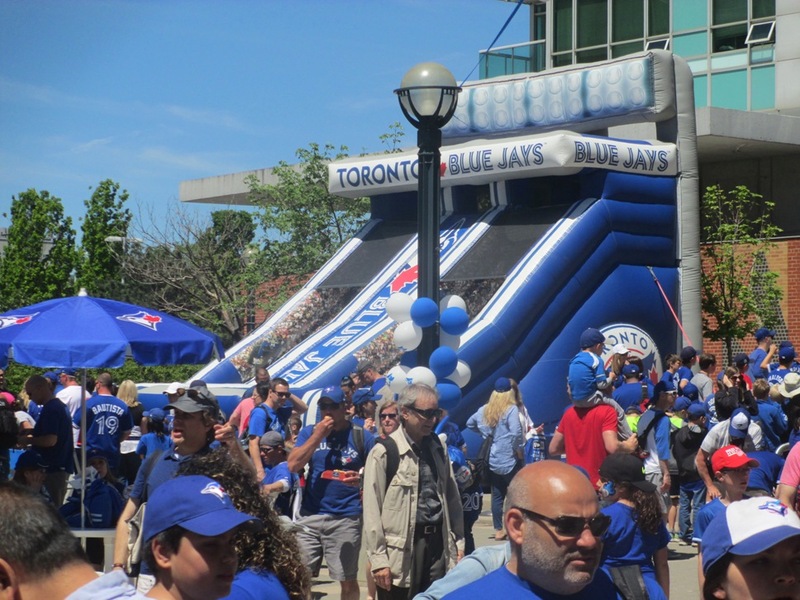 The Blue Jays sell a lot of multi-game packages, so fans have lots of extras to unload. Click here to search for Blue Jays tickets at SeatGeek and tell ‘em Kurt sent you…they are an affiliate of Ballpark E-Guides. Because no one’s going to buy a Flex Pack for Mediocre Games. Cheap Blue Jays Tickets, Tip #3) Get A Multi-Game Pack. There are plenty of deals for those willing to splurge on a few games; the Jays will throw in a few perks with multi-game packs too, like Opening Day or postseason ticket offers and discounts in the team shops. This is a popular choice with locals; if you plan on going to a few Jays games, get a friend to split the cost and you’ll both save some cash. Those are three tips for getting your hands on cheap Blue Jays tickets…and while I don’t often recommend patronizing scalpers, they do tend to be plentiful here and can offer you a nice deal if the time is right. But you didn’t hear that from me. 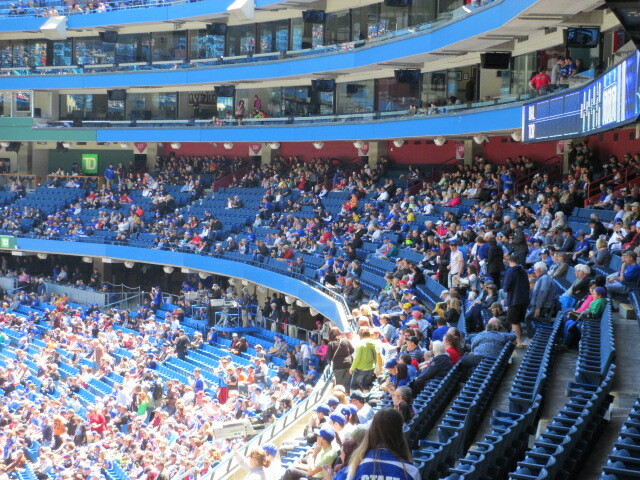 If you’re looking at tickets for a Blue Jays game, here are some essential Rogers Centre seating tips for each of the three levels of seating (at least, the three levels for the rest of us). So that you know, I recommend against sitting in the outfield seats in each section, for reasons that I detail here. But if you are sitting inside the foul poles, here’s some things to know. You know you’ve arrived when you’re sitting in the darker seats. 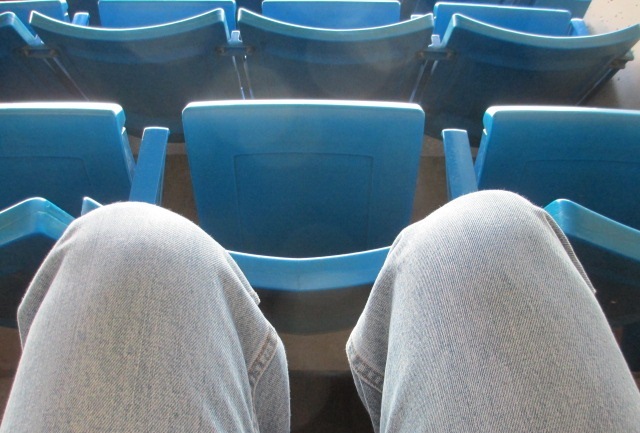 Rogers Centre Seating Tips, #1) The 100 Level. The slightly padded Premium Dugout seats cost only a couple of bucks more than the Field Level seats behind them, so if you’re handing out that much money you might as well fork over a little extra for a closer, padded seat with a cup holder. If you’re having a hard time finding something good behind home plate, start looking further down at the Bases seats, because the price for Row 1 in these sections is the same as the last row. Field Level Bases are also significantly cheaper than Infield, so you can save some bucks moving a section over. In the corners near the foul poles, the seating is lowered and you need to use a walkway behind the seats to get to them…which apparently is too much of a hassle for most fans, because these sections can be fairly empty on low attendance nights and aren’t strictly patrolled. Good place to improve your view if you want to. Note the contrast in shade. In Toronto, either group of fans could be smarter. 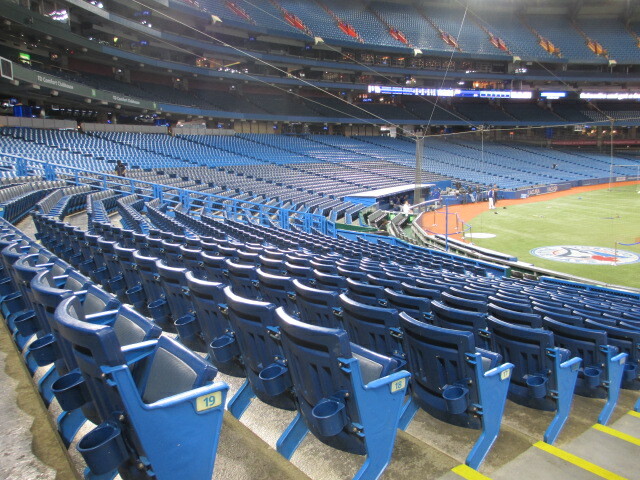 Rogers Centre Seating Tips, #2) The 200 Level. 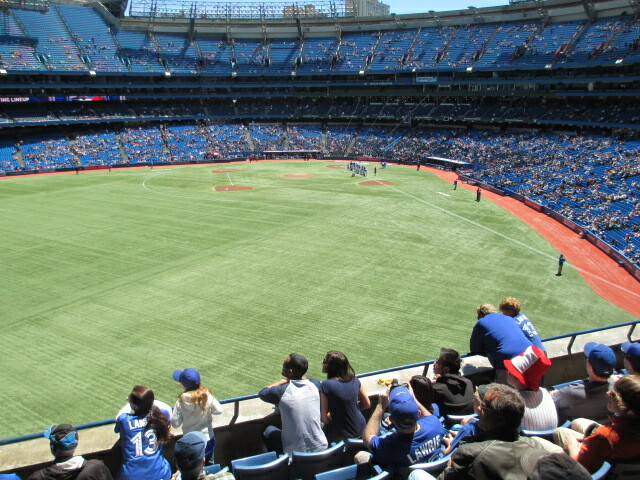 The 200 level seats in the infield are no longer cushioned unfortunately, but the view is fairly nice for seats that are further back from the field level. They cost about the same as 100 level seats, so your choice is between a closer seat or a slightly wider and shaded one with a cup holder. 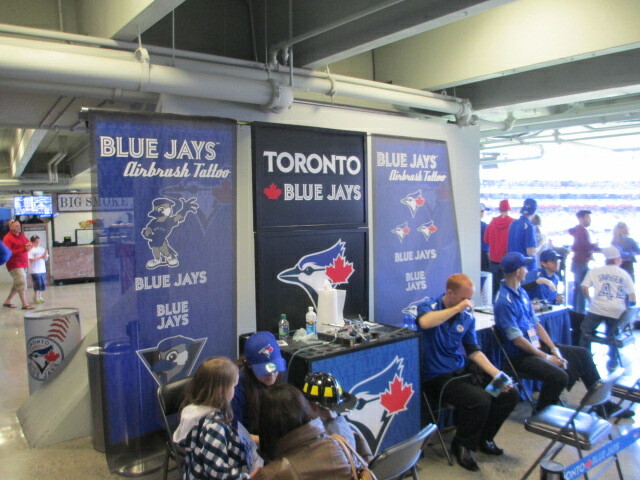 The 200 level has its own concourse and concession areas, including the 12 Bar named for Roberto Alomar’s number. You can enjoy a drink at a table with a view at the 12 Bar, if you get tired of your seat. Concession lines get long at this level for some reason, so grab your grub beforehand. Like with the 100 level, sections are divided into “Infield” and “Bases”, and again, the difference in price is significant enough to be well worth moving a section over. For day games most of the upper rows of the 200 sections are usually covered in shade, so that could be a factor choosing a seat in hot (or cold) weather. 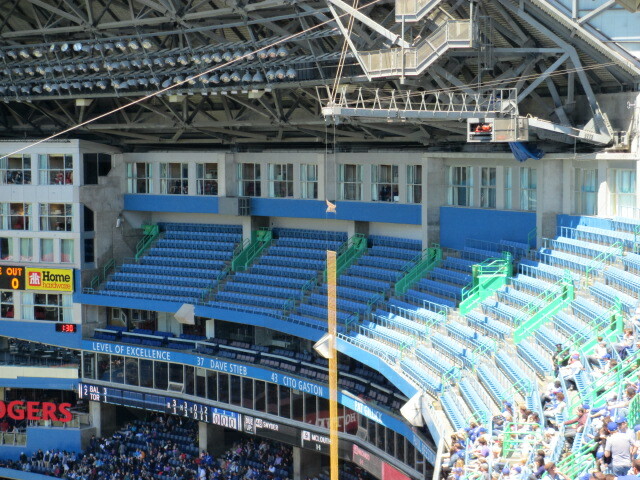 Rogers Centre Seating Tips, #3) The 500 Level. The 500 level was called the SkyDeck in the SkyDome years, and you’ll see why when you’re up there. These seats take a long walk on dark, boring ramps to get to if you’re not using an elevator, they are very high and the angle is one of the steepest I’ve experienced in a ballpark. But these are easily the cheapest seats here; the best part is that ticket prices are nearly the same throughout the entire level. If you get a lower row (which is a bit tougher to do), the view of the action isn’t bad at all. There are 25-27 rows in most sections, and right field sections can have as many as 37. To put it mildly, yikes. If you do end up with seats that high, prepare for a nerve-wracking trip down the steps more than anything else. The only other problem with the upper level seating, other than the acrophobia, is that the food selection isn’t as great there (although it has greatly improved of late). If you’re sitting up here and this matters to you, try getting something downstairs first. 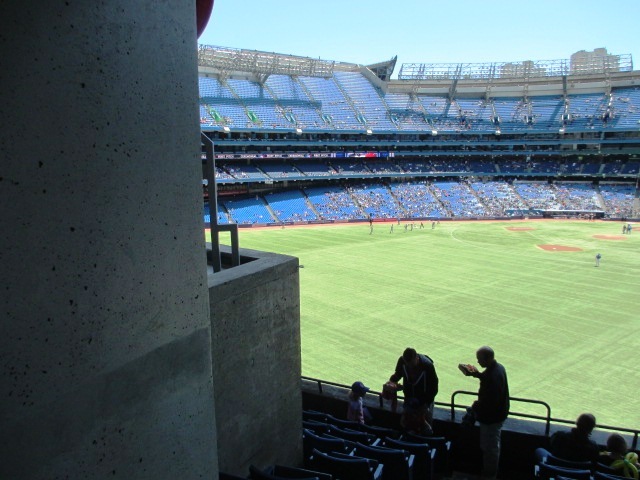 There’s some Rogers Centre seating tips that hopefully help you out on your next visit…don’t forget to try my affiliate friends at SeatGeek for Blue Jays tickets. If you want to know why I recommend against sitting in the outfield here, read this post. I wouldn’t say that the home of the Blue Jays tops the list in ballparks known for culinary greatness, although they have definitely improved things in recent years. 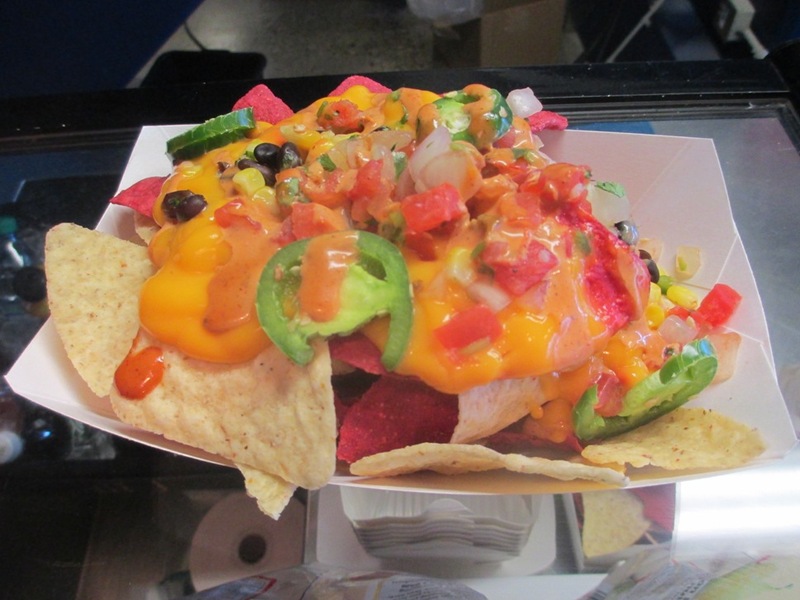 But that there are several different editions of Rogers Centre nachos is impressive to me; chips with stuff piled on them go over pretty well here. With a helpful listing of the ingredients, just in case. 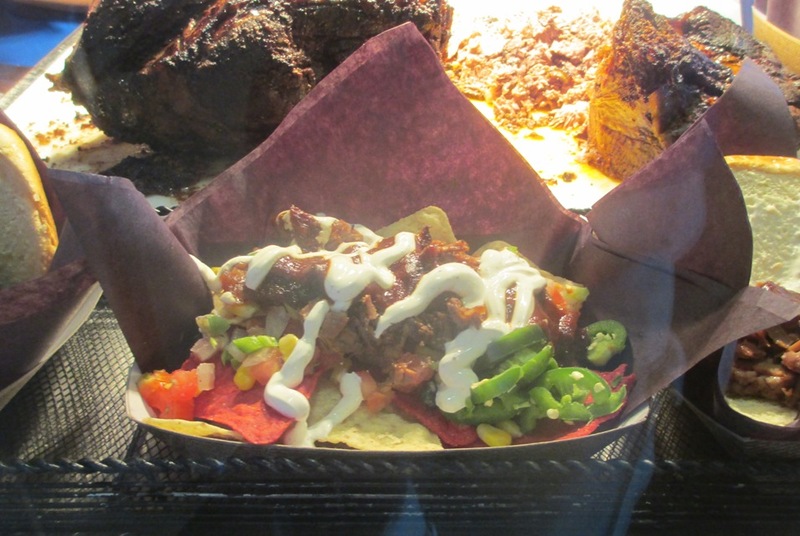 Rogers Centre Nachos, #1) The Muddy York Market. The Muddy York is the large food court at Rogers, and there’s a separate nachos stand where you can actually customize your plate of nachos. Nachos with the visual enhancement of smoked meat sitting behind them. Rogers Centre Nachos, #2) The King Club. At the Budweiser King Club bar area behind home plate is a carved meat station, and you can order “Bases Loaded Nachos”. These babies are covered with beef brisket, BBQ sauce, jalapenos, caramelized onions, pico de gallo, three bean chili (! ), and something called “pepper infused sour cream”. The Muddy York Market has BBQ nachos too, but they’re not as BBQ, if that makes sense. Please don’t spit these at the umpire. Rogers Centre Nachos, #3) The 12 Kitchen. The 12 Kitchen is named for star Jays (and Orioles!) second baseman and Hall of Famer Roberto Alomar, and has more of a Latin theme in its food. 12 nachos are made with a mix of plantain and tortilla chips (and rightly so, personally I don’t get the kettle chips thing), covered with adobo spiced chicken, queso franco, guacamole, sour cream and green onions. They’re kind of Christmasy looking nachos, aren’t they? Rogers Centre Nachos, #4) Intentional Guac. The Intentional Guac stand is located on the upper level as I write this, sparing SkyDeck patrons a trip down long ramps to the other nachos. And they’re perfectly serviceable nachos in their own right. It’s the gooey cheese type substance and un-pickled jalapenos, but you do get pico de gallo, beans and corn on them. And appropriately given the name of the stand, guac is available too. The ingredients for these nachos plates could change when you visit, but as I write this these are the three distinct food stands where you can get some variation of nachos at Rogers Centre. It’s among the more popular non-hot dog foods inside this ballpark…but many fans go for the street meat outside too. I highly recommend against driving and parking near Rogers Centre for Blue Jays games. If you don’t have to, don’t. 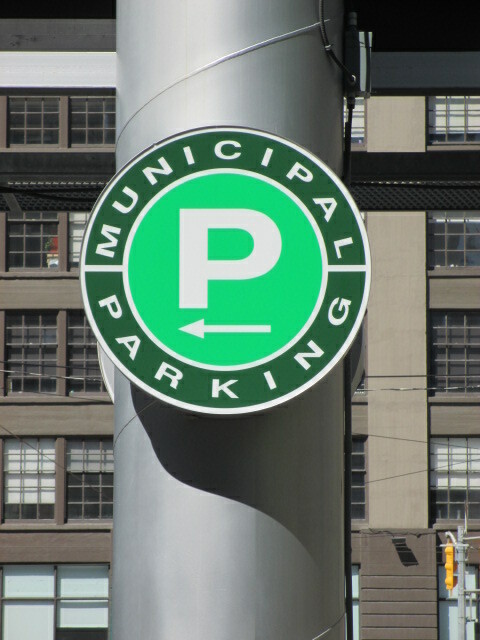 But if you must, try using one of the “Green P” lots. This is a pretty nice evening rate for baseball parking. Green P Lot #1) 40 York Street. 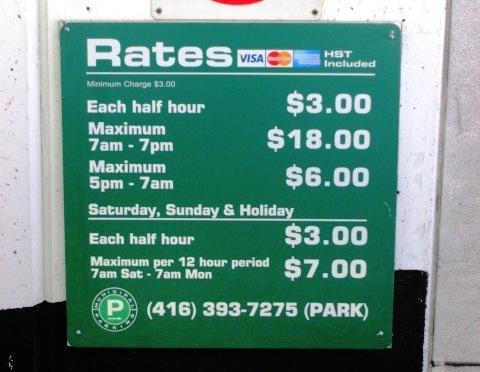 I’ll probably get some grief for sharing this favorite spot of fans, but it’s probably the best deal that you’ll find for parking near Rogers Centre. It’s not only cheaper, but the event rate kicks in at 5:00, unlike 6:00 for most lots, so you don’t have to time your arrival so much. It’s a convenient spot too, especially coming from the east. Green P Lot #2) 10 Portland Street. The night rate starts at 6:00 PM for this one, but it’s still fairly convenient at about a half mile from the ballpark, for a ten minute walk, and this one offers a relatively easy out going westbound. Green P Lot #3) 2 Church Street. If you can’t score a spot at 40 York, this one isn’t bad coming from the east. It’s got over 2,000 spaces and has cheap nightly rates, including a Saturday special of $1/hour for the first two hours. So on Saturday especially you can arrive plenty early for a good spot and still pay a small fee to park for the evening. One caution about the 40 York and 2 Church Street lots: these are both close to the Air Canada Centre, home of both the Maple Leafs and Raptors. 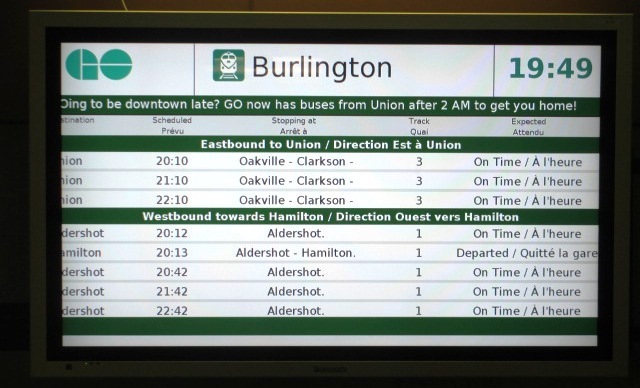 I strongly recommend checking first to see if there is an event there before going…if there is, get there very early or use public transit. 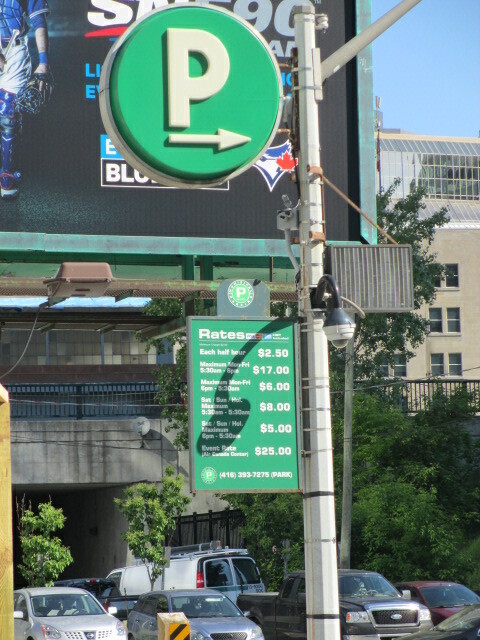 There are other good options for parking near Rogers Centre, but I would advise that you try Green P first, especially if you can walk a little bit. If you’re visiting Rogers Centre in Toronto for the first time, there are a few tips you definitely need to know. 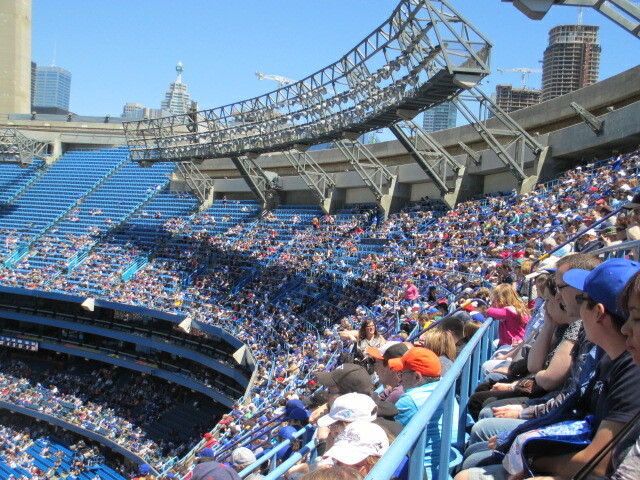 The home of the Blue Jays is unique in many ways, some of which present some interesting challenges for the fan. Foiled by the bicycle rack roadblock again! Visiting Rogers Centre Tip #1: Consider demand when buying tickets. When the Blue Jays are good, they draw very, very well. That means you should plan ahead and buy from the team first. Most weeknight games against opponents other than the Yankees or Red Sox don’t sell out, so you can pick up tickets at the box office where the fees are lowest. Should you be looking for a low demand game…say, if the Jays are having a disappointing season…sites like SeatGeek will help you find the best deal on tickets. 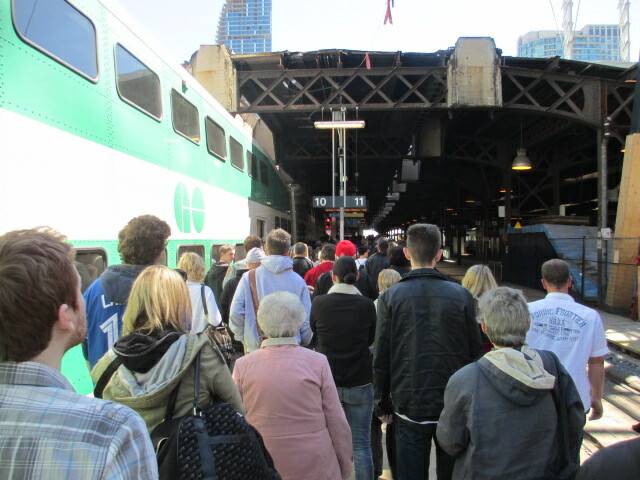 Weekends sell far better than weekdays, partly due to the insane rush hour Toronto traffic. The ushers are fleet of foot in the empty sections. 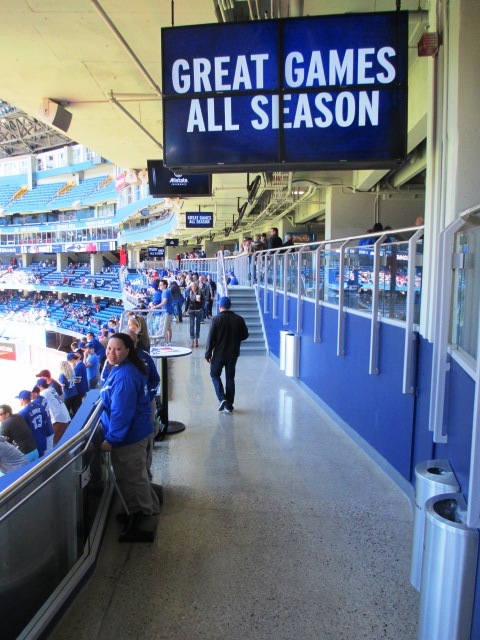 Visiting Rogers Centre Tip #2: Try the mezzanine level. The mezzanine level at Rogers isn’t as close to the field as you might like, but the seating is much lower than the 500 SkyDeck level, and the seats have cup holders. The seats are around the same price as the field level seating below them, and it will be easier to duck out of the elements there should you have the need. One caution though, don’t sit in the outfield on the 200 level…way too many ways to lose the view. Stay in the infield if you can. The Force is with you, young Skywalker. 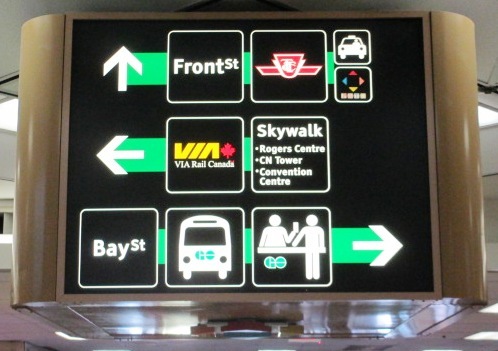 Visiting Rogers Centre Tip #3: Use public transit (TTC or GO). Rogers is in the heart of downtown Toronto, and there are two major highways that both run south of the ballpark that get jammed at rush hour. 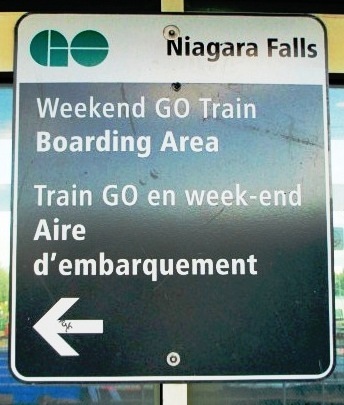 During the week especially, you don’t want to be driving there; instead use the TTC from elsewhere in the city or the commuter-friendly GO Transit trains from the suburbs. 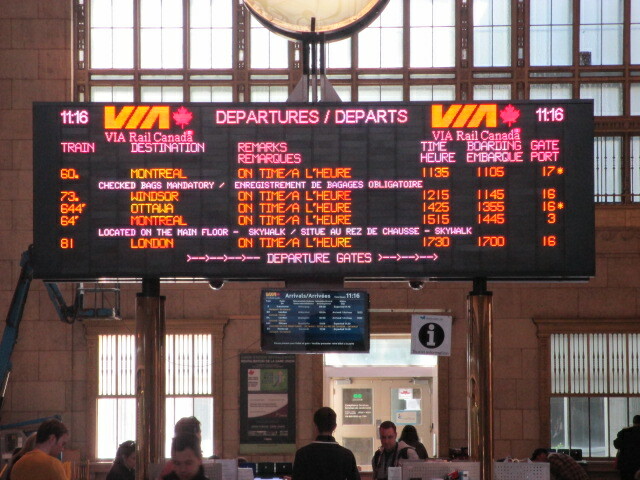 The Yonge-University-Spadina line of the TTC stops at Union Station; all of the GO lines from every direction also stop there. Union Station is a short walk to the ballpark through a covered walkway, and there’s a whole lot of cheap places to fill up a pre-game doggy bag. Note the gentleman’s backpack, suitable for carrying veggie dogs. Visiting Rogers Centre Tip #4: Get the street meat. 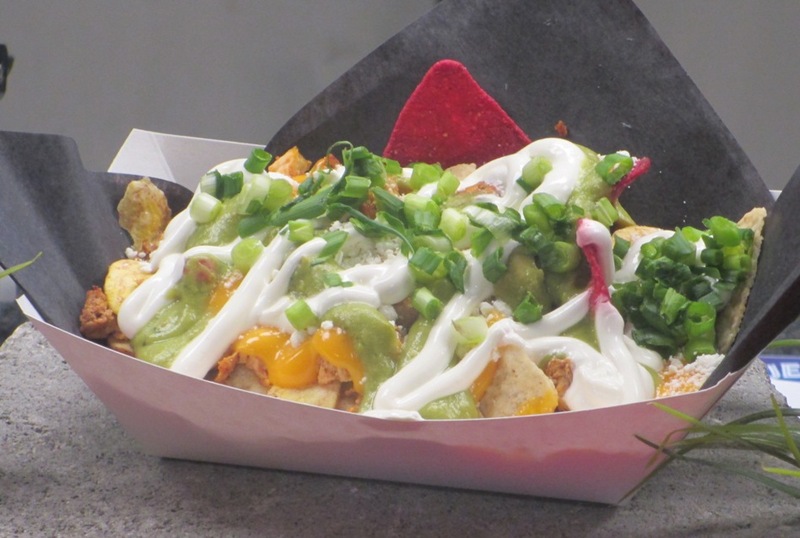 Rogers Centre has great food items, especially if you’re into nachos…check them out at the Muddy York Market, the King Club or at the 12 Bar. 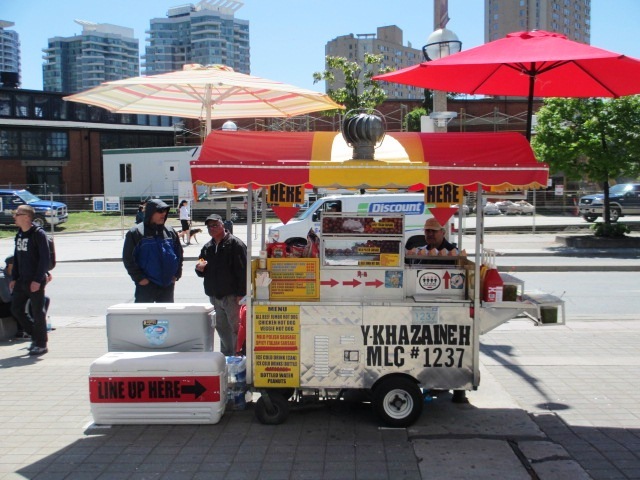 But to get a good-sized dog at a much cheaper price, Torontonians will tell you to get the “street meat”…dogs from the numerous hot dog carts that surround the stadium. You can get a good-sized dog for about half the cost of one inside, and you can pile on a great choice of condiments. There are even veggie dogs from Yves out there if you look. If you want more variety, check out Front Street north of the ballpark; there are always some unique food trucks there. Really? You’ve been expecting moi? 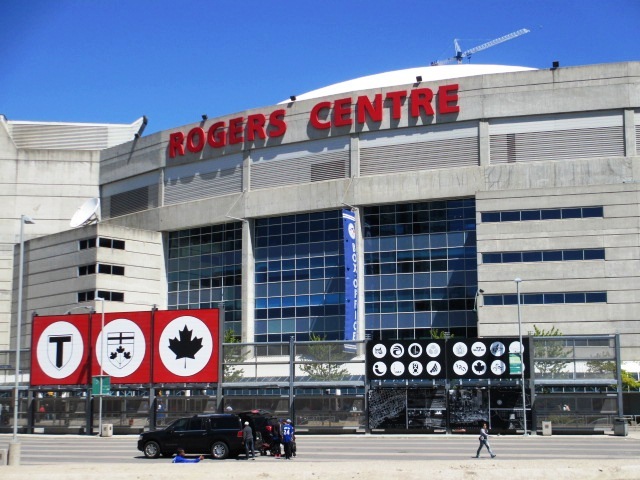 Visiting Rogers Centre Tip #5: Remember you’re a foreigner (if you’re visiting Canada). Toronto isn’t very different from most baseball cities, but remember a few things…like checking with your phone service provider about using your phone abroad, getting your money exchanged at a bank or hotel and not at the exchange centers that take an exorbitant cut, and check with your credit card company about overseas purchases. Gas is much more expensive in Canada too, so if you can, fill up stateside. Oh, and don’t forget your passport! 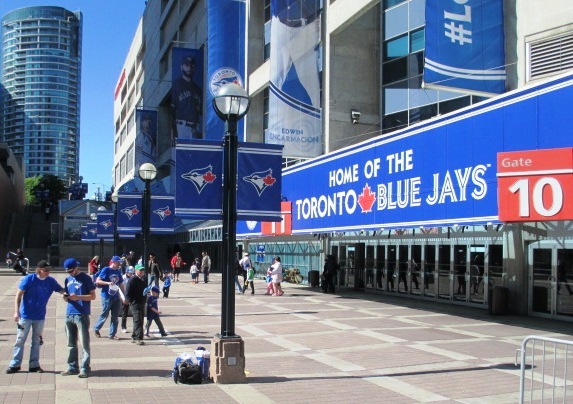 There you go; five tips to help you for your first time visiting Rogers Centre. If you’re bringing the kids, remember Saturday is Jr. Jays day, and that’s when the kids can get their face painted and run the bases and stuff. And relax, because you know a game will be played in this ballpark whatever the weather. The Rogers Centre seating chart isn’t terribly complicated, and there are plenty of good spots, but there are some seats you should definitely avoid. Rogers Centre was arguably the last baseball stadium built with as many seats as possible and little regard for the intimacy factor, although you could make that case with the new Yankee Stadium. In such a venue, there are going to be some bad seats, although at Rogers they are kept to a relative minimum. 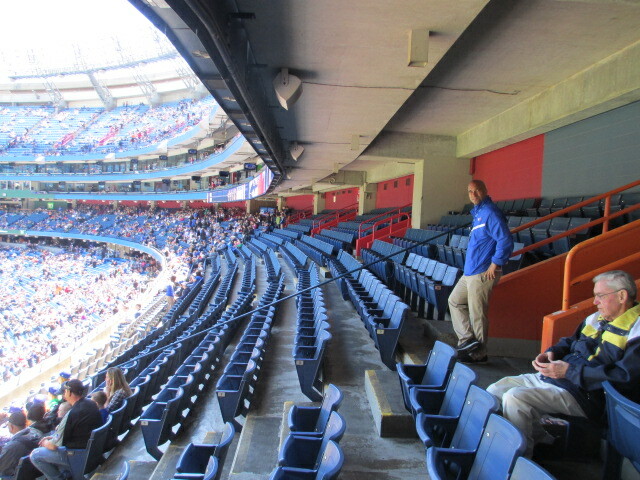 If you really want to avoid the worst of Rogers Centre seating, stay away from the 200 level outfield, especially the higher rows. I suppose some fans could argue that the 500 level outfield seats are worse, what with the height of the seats and the distance away from the field. I would not be one of them. With the 500 level outfield seating, it’s more open, there is more leg room, and you aren’t dealing with obstructed views so much. Besides, given the crowds the Blue Jays draw, most of the time those sections are closed off anyway, so you’re not likely to need to compare. There are multiple problems with the 200 level outfield that actually make it less preferable to the cheaper 500 level seats. Objects in view are closer than they appear. Obviously. The bullpens are in front of the 100 level, and the 200 level is even further back from that. Needless to say, this doesn’t help the view either. The second problem is obstructed views. From most of the 200 outfield seats, you won’t be able to see the big scoreboard, but that’s not even the worst of it. There are pillars in between sections in the higher rows, and if you’re sitting in the higher rows there’s a chance you could be missing a good portion of the outfield, as shown in the photo above. 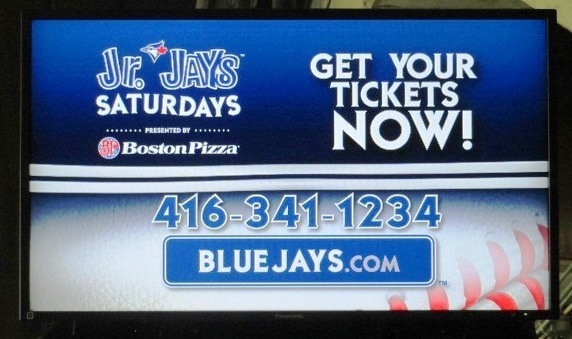 Even the Yankees discount the price of tickets like this, but apparently the Jays do not. OK, I’m a big guy, but still. There are some other issues too…not a lot of choices of concessions (although the new seating area in center has some things), very little leg room, and the back rows seem to be more a part of the concourse than the ballpark. Relatively minor, but that doesn’t help matters. If the choice is between 200 level outfield—especially above Row 6—or a 500 level seat, go for the 500 level. If 200 outfield is all you can get, you may prefer standing somewhere. Because the 3.048 decimeter long dog doesn’t sound as tasty. Rogers Centre Food, Tip #1: The Garrison Creek Home Run Footlong Dog. OK, just call it a Home Run Dog or Garrison Footlong if you don’t want to say all that when you’re debating what to get with your date. But this puppy is one nicely dressed dog, different from any I’ve seen at a ballpark. It’s a footlong dog obviously (and come to think of it, why isn’t it a two-decimeter dog or whatever the metric version of it would be? 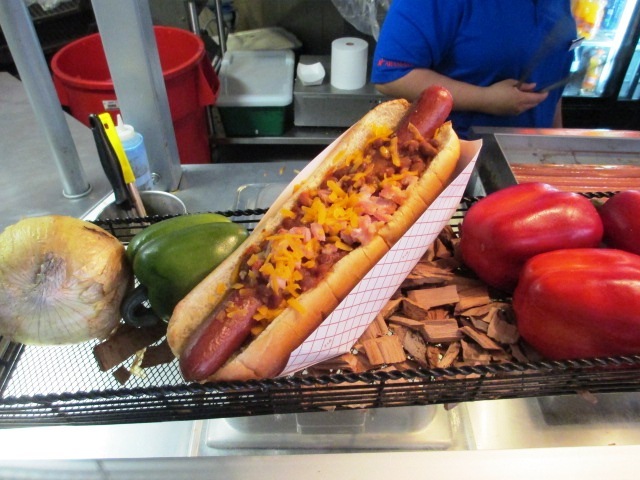 ), but it’s thicker than most ballpark footlongs…and it’s adorned with maple flavored baked beans, cheddar and bacon bits. You could just put bacon bits in maple baked beans and I’d be happy, but add that big dog to it and I might even pay to see a losing team. Be like Deion and have “both”. Rogers Centre Food, Tip #2: Sweet Potato Fries. At the Gourmet Frites stands (and at other stands around the ballpark), you can find appetizing looking sweet potato fries. Judging by the amount of people I saw carrying them around, they’re a pretty popular item here. 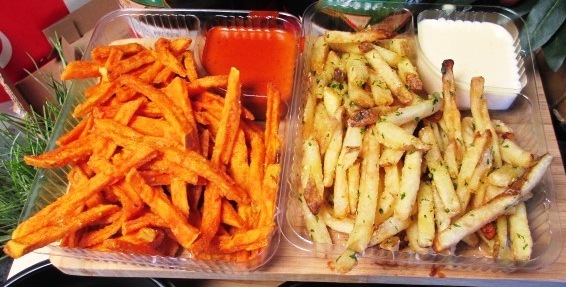 The sweet potato fries come with a chipotle style dipping sauce, so it’s not something you can walk around eating, but it isn’t healthy to walk while eating anyway. And I’m guessing that people who choose sweet potato fries are looking for a healthier choice over just plain old potato fries. Bacon gravy…there’s no wrong amount. 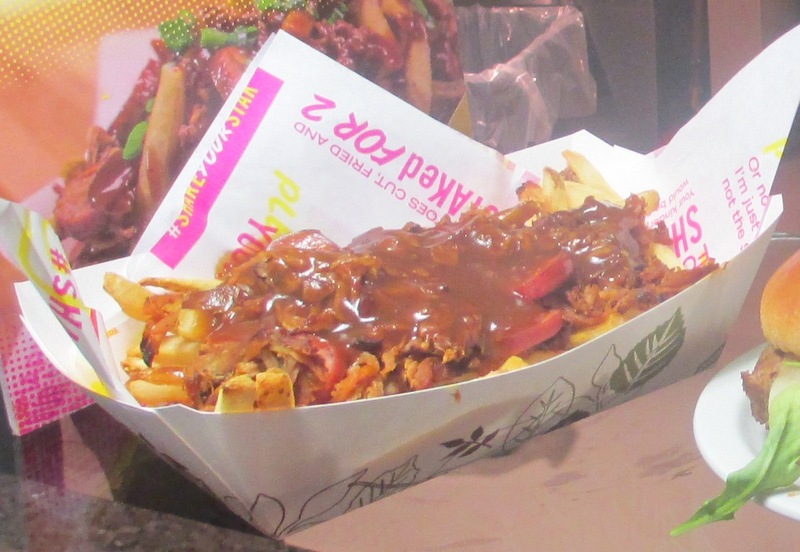 Rogers Centre Food, Tip #3: The Hogtown Stak. The Hogtown Stak, so I’ve read, is a creation of executive chef Elizabeth Rivasplata, who the Blue Jays hired both for her cool name and to answer the knock on the lack of gourmet options here. It’s a truly amazing plate of baseball food…russet potato fries smothered with pulled pork, farmer’s sausage and smoked bacon gravy. Red jalapenos too, so be ready for the kick. It’s big; you’re probably want to share it. Find them at the Muddy York as I write this. There are plenty of other choices of Rogers Centre food; I mean no disrespect to Liberty Village sausage poutine or the multitude of choices at the Muddy York Market. Or the impressive selection of nachos. Can You Bring Food Into Rogers Centre? 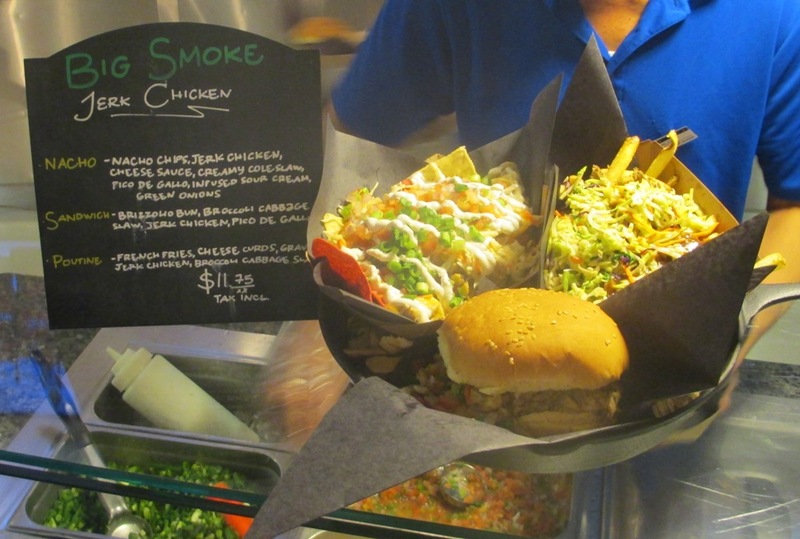 There’s no shortage of a selection of food at Rogers Centre, but as in any ballpark, it’s expensive. Fortunately, if you want to bring food into Rogers Centre, you can…and you have some great alternatives just outside. 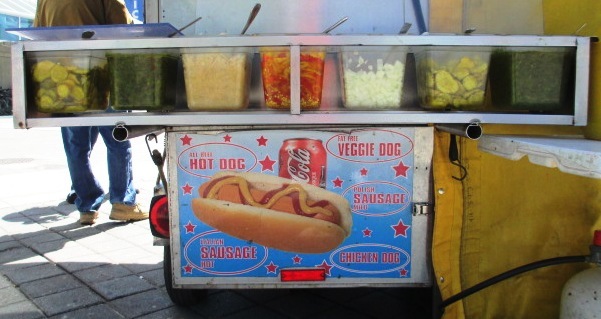 Free hot dog if you can properly pronounce the name of this cart! Some ballparks have a better outside vendor scene than others. Fenway Park and Wrigley Field are among the best, but so are Yankee Stadium and Camden Yards…which would suggest that a good choice of outside vendors is actually more due to a ballpark’s location than its age. Being in the heart of downtown Toronto, Rogers Centre fits into this category, but it’s not quite the same sort of activity. Outside, the food carts selling hot dogs and sausages are plentiful largely because the Blue Jays allow them on the grounds. 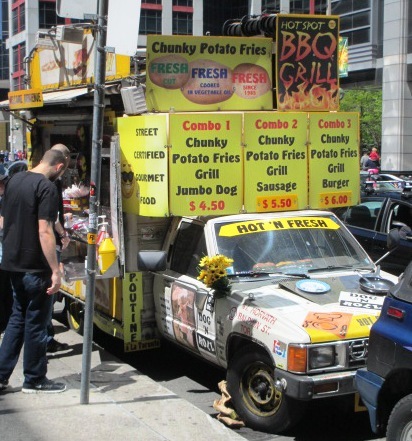 Torontonians refer to the vendors’ wares as “street meat”, an appropriate appellation. 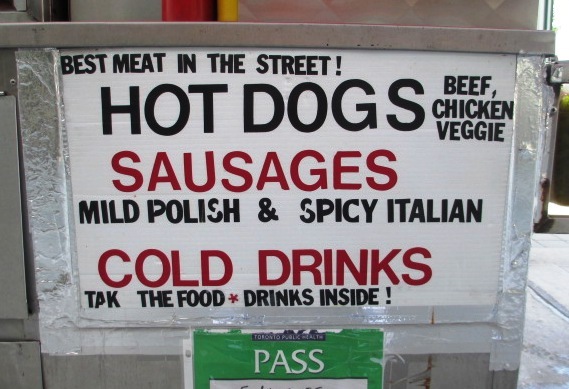 I like “street meat” better than the dubious sounding “meat in the street”. In Toronto, Rogers Centre is surrounded by such carts. Many of them are operated by Shopsy’s, a popular local deli, or Yves, a manufacturer of veggie dogs and burgers. But some of them are operated by local Joes just making a buck. 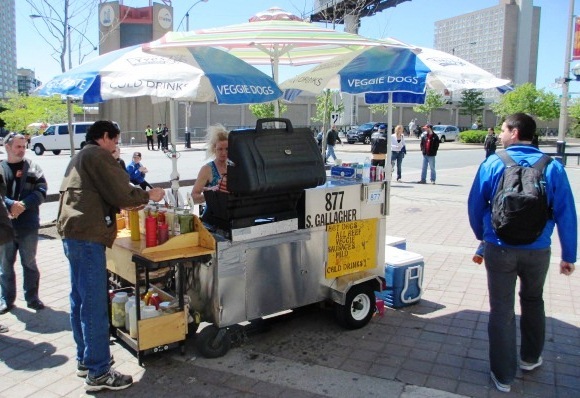 The carts on the Rogers Centre grounds don’t differ much in their offerings: they mostly sell large dogs, sausages, and veggie versions of both. I don’t think any of us truly appreciate what our world would be like without condiments. The neat thing is the condiment choices; you can pile anything from chopped onions, hot peppers, pickles, sauerkraut, even bacon bits if you’re lucky. The dogs are also hefty, making them well worth the price. While the carts on the grounds of the stadium certainly can handle your hot dog or even your vegetarian “meat” fix, there are some extra options if you’re willing to venture onto Front Street north of the ballpark: during my visit, there was a Don Juan’s truck, whose fries are very popular, and I also spotted a truck called Crazy Fries, which sells burgers along with dogs and the ever-popular poutine (fries with gravy and cheese). The policy to bring food into Rogers Centre is quite lenient. You can even bring a whole pizza, I’ve read. 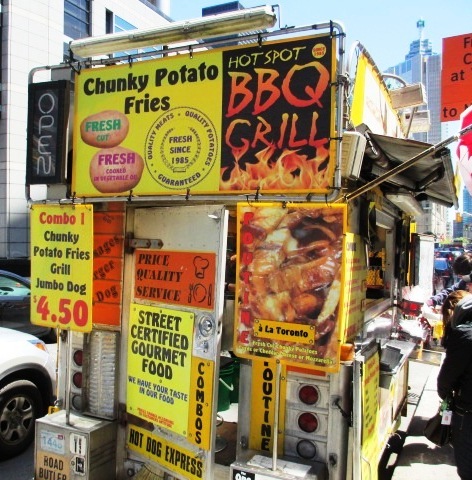 If you’d like to see what’s in the neighborhood as far as street food, check out the “Toronto Food Trucks” website. How do they get that pig roaster inside the truck? It’s not that the inside food at Rogers Centre is awful by any means—they have good-sized dogs, popular sweet potato fries and an impressive selection of nachos among many other things. But as always, the stuff is quite overpriced inside, and maybe it’s just me, but it seemed even more so at Rogers. So if you not only want to save a buck but get a tasty hunk of ballpark food, talk a walk around and go for the street meat. A quick glance at a road atlas reveals that unlike any other MLB city, Toronto isn’t in the United States. If you’re headed to Toronto for a Blue Jays game, you should probably be aware of some tips for visiting Canada. What’s all that French stuff on the schedule? That’s a cool thing, of course, because it makes you the ballpark roadtripper an international traveler! But it also means that you’ll be entering a foreign country, maybe for the first time, and if you do there are definitely some important things to know. Someone forgot to bring quarters again. Happens every day. Tips For Visiting Canada, #1: Have a passport. Yes, you’ll need one of these even just driving your car across the border into Canada, and you’ll have to go through a customs service if you’re flying so they want to know you have permission to enter. This didn’t used to be the case, but it’s something you need to know now. 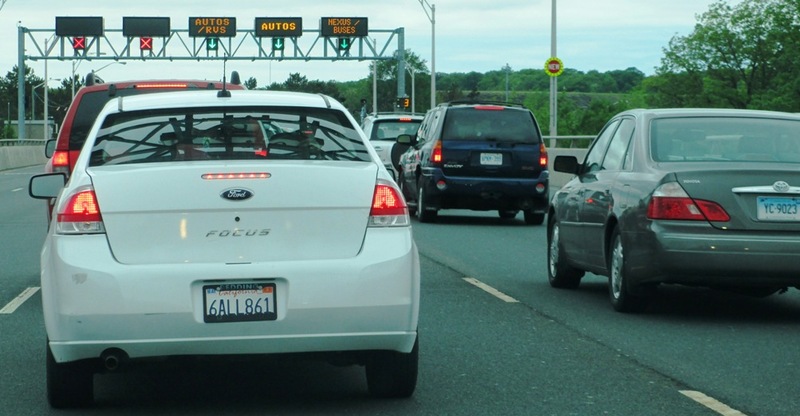 Sometimes there are long delays at the border because someone forgot something pretty important. Don’t be one of them. Use your Canadian credit card. Tips For Visiting Canada, #2: Be sure you can use your phone. I learned the hard way that my phone service didn’t cover me in Canada…I had to send e-mails to my wife from the hotel and tell her to call me there. Eventually I got myself a phone card which helped, but it will save you a big headache if you know beforehand if you can use your phone there. And you’ll be surprised at how much you miss it. It’s that American dollar sign that throws off foreigners. 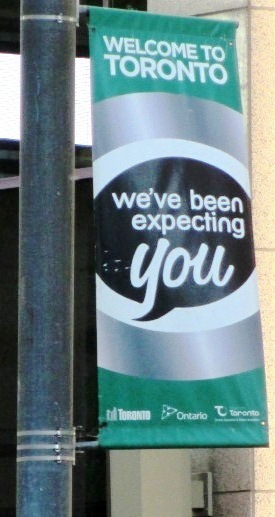 Tips For Visiting Canada, #3: Be aware of money transactions. Get your money exchanged for Canadian money at a bank or at your hotel; do not use the exchange centers that take a big cut of your cash. Also, check your credit card company and see if they add foreign transaction fees, and if they do, use cash as much as you can because those fees add up. Remember that you can use American money at most establishments, but you will get Canadian money in return, so as you’re leaving don’t pay for your cup of coffee at Tim Horton’s with an American twenty. It’s a headache turning Canadian dollars back into U.S. dollars, even at TD Bank. Take it from me. There are some more things to know, but these are the important ones. The Blue Jays of 1993, who played in what was then called the SkyDome, and the Blue Jays of 2014 were similar in that the majority of either team’s superstars weren’t home grown talent. You’d think they never lost a game. Actually, back then they didn’t lose very often. Joe Carter, Roberto Alomar, Paul Molitor and several other stars on the 1993 champs were acquired from other teams, while recent Jays teams featured Colby Rasmus, Melky Cabrera, and R.A. Dickey among others, all of whom were stars before they came north. But it doesn’t seem the same as it did in 1993, when everything seemed to go the Blue Jays’ way. And like the team, the perception of their home ballpark has changed too. 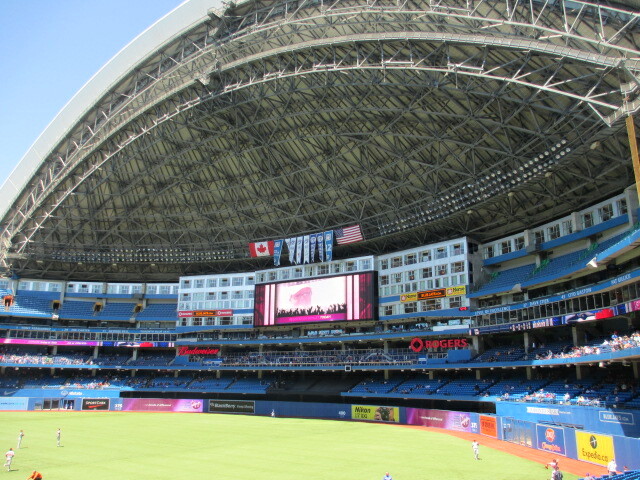 When the Blue Jays consistently finished atop the AL East, their ginormous brand new home had a different name— SkyDome (not “the” SkyDome, just SkyDome). It was named through a fan contest, with the winner receiving lifelong tickets to any events there. SkyDome was seen as modern, futuristic, the spark of change in baseball venues from stadiums to entertainment centers. SkyDome influenced today’s ballparks in more ways than you probably think. Sit-down restaurants with a view and chain eateries are common in baseball venues today, but they were a novelty when SkyDome first opened. It was also the first ever venue with a working retractable roof. Today six major league parks have opening roofs, rendering “Spahn and Sain and pray for rain” obsolete as a managing strategy. And there was that hotel attached to the ballpark, with rooms overlooking the field—apparently without consideration that folks may tend to amorous desires in front of thousands, as some did before the hotel made guests sign an agreement not to share their wares in the window. That hasn’t caught on as a ballpark feature, but it still could someday, especially in the minor leagues. SkyDome, and its features and prices, was the future of ballparks. But just a couple of years later Camden Yards would open for business to rave reviews in Baltimore. Almost overnight, concrete and artificial turf became a serious liability with fans. This 180-degree change in ballpark design trends coincided with the declining success of the team. 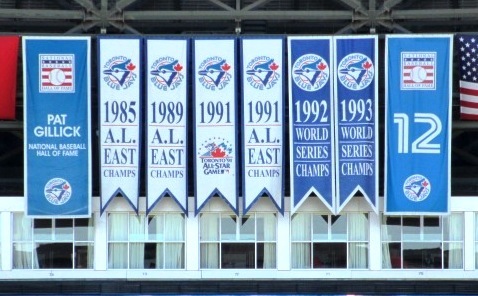 The Jays had won several AL East titles before finally taking the World Series crown in 1992 and 1993, with a team that could pitch, field and hit like few in history. The 1993 Blue Jays roster read like a who’s who of baseball’s biggest stars at the time: Roberto Alomar, Paul Molitor, Joe Carter, John Olerud, Juan Guzman, Jack Morris, Rickey Henderson, the list goes on. So…did the Blue Jays win? After coming up short in the playoffs a few times, they finally came out on top of the baseball world two years in a row. One of the most iconic moments of baseball history is of Joe Carter leaping into the air running the bases following his World Series-winning home run. A packed-to-capacity crowd that night made so much noise you could barely hear the fireworks in the ballpark. In its early years, SkyDome was filled to capacity almost every night, and for three seasons the Jays topped the four million mark in attendance, averaging a still today unheard-of 49,000+ per game. This was in the days before the Internet and StubHub…so Blue Jays tickets were extremely tough to get. But less than a year after Carter’s home run landed into the deliriously ecstatic crowd, baseball went on strike, and like with many teams, the Jays’ attendance crashed as fans everywhere shunned a sport that had sacrificed a World Series to the altar of palpable greed. Maybe if it was “Mister Rogers Centre”, people would warm up to the name. 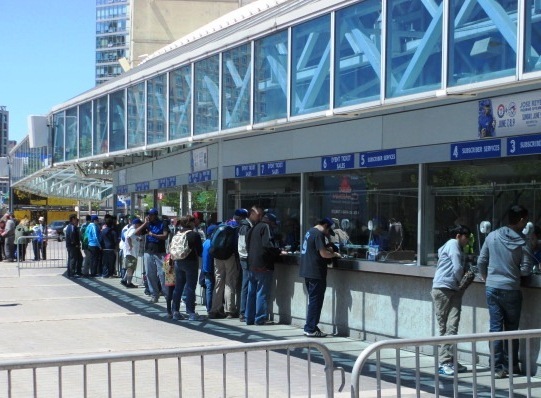 The Blue Jays never did bring four million through the turnstiles again, many times averaging just half that amount, especially as the 1993 stars departed and the team’s win totals went downhill for several years. In their recent return to contention with a division title in 2015 and a wild card victory in 2016, they’ve definitely increased their numbers, but in 2016 they still only reached 3.3 million. Perhaps it’s fitting that the name of the venue has changed. Baseball is still very popular in Toronto, but looking back at the atmosphere and novelty of SkyDome, Rogers Centre almost feels like a different ballpark. It’s still a fine venue in its own right and houses a competitive team, but things seem different today. People nostalgic for the SkyDome name are no doubt also nostalgic for capacity crowds and World Series games. Any fan can appreciate that. 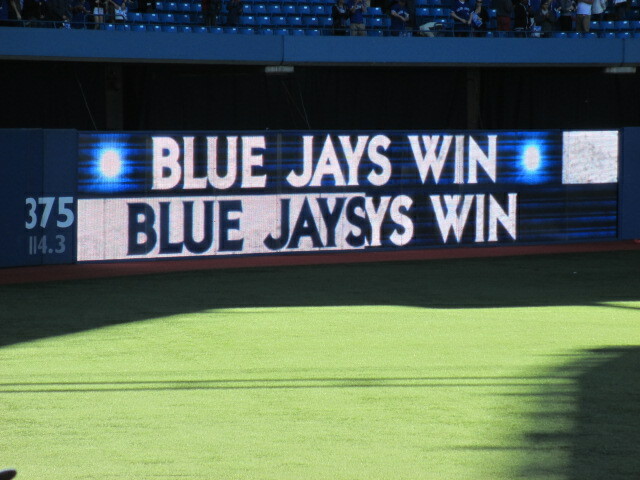 It was a wonderful time in Toronto baseball.